The Alex Brands® family of brands is comprised of some of the most iconic, recognizable and award winning toys in the industry today. With a commitment to helping children become more active and develop their imagination and creativity, Alex Brands offers toys, games for children of all ages. Scientific Explorer Get Glowing Science gives you everything you need to create alternate sources of light for a dark room. Experiment with a black light, glowing bouncy balls, phosphorescent glow powder, glow sticks and glowing stickers. The instruction manual guides you through the steps of each experiment while teaching you the science behind them, so you can fully understand the concepts and come up with experiments of your own. Includes U.V. button light, crack and shake glow stick, sheet of glow stickers, ball mold, 3 packs of glow-in-the-dark ball powder, plastic cup, 2 zip bags and instruction manual. Recommended for children 6 years of age and older. 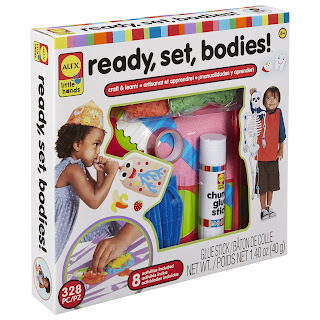 ALEX Toys Little Hands Ready, Set, Bodies is 8 arts and crafts projects that teach your little one what’s going on inside of them. Make a body collage, a heartbeat drum, a paper bag lung, connect the bones of a skeleton with pipe cleaners, a brain cap that shows what’s on your mind, a nutrition chart, a giant mouth to brush and learn to read without using your eyes! Includes 20 printed paperboard shapes, 6 printed paper shapes, 269 stickers, paper tape (6.5ft. ), glue stick (1.4oz. ), 2 colors of shredded tissue paper, 2 colors of yarn (18in. ), 7 paper cups, 18 pipe cleaners, paper straw (8in. ), paper bag and fun fact instructions. Recommended for children 4 years of age and older. Project Mc2 Way to Glow Science teaches you the secret to finding the clues that hide in the dark. Every super spy scientist needs to know what, why and how to make things glow. This kit includes a hand held black light, a glow stick and more to help you with your luminous experiments. And just for fun, create your own colorful glowing bouncy ball. Includes push-button black light, 3 glow in the dark bouncy ball powders, bounce ball mold, crack and shake glow stick, glow in the dark sticker sheet, pink pencil, plastic cup, 2 resealable bags and instructions with lots of glowing experiments. Recommended for children 8 years of age and older. 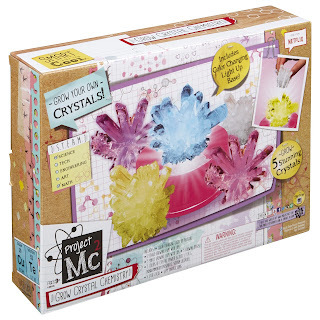 Project Mc2 Grow Crystal Chemistry is a science kit that works like magic! Young super spy scientists can stir the magic powder in water, add in the growing base and watch their crystals grow. The chemical reactions create beautiful keepsakes. Display each unique crystal on the color change base for a fun light show or to use as mood lighting for your lab! Includes light up display base, 5 growing bases, 5 growing cups, 5 colors of crystal powder, stir stick and easy instructions. Requires 3 AAA batteries (not included). Recommended for children 6 years of age and older. Alex Brands has quite a few top holiday gifts for kids this season! As a mom of 3 girls I can tell you Alex Brands NEW! 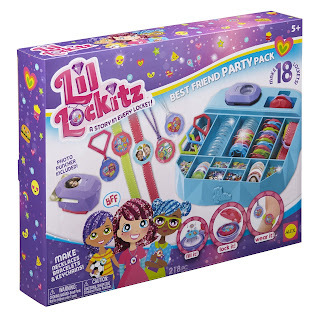 Lil’ Lockitz Best Friend Party Pack is sure to be a huge hit with little girls this holiday season. My girls absolutely love this set! I love that it's large enough for all 3 of my girls to share and enjoy together. It's perfect for girls 5 and up and would make a terrific gift this holiday season! NEW! 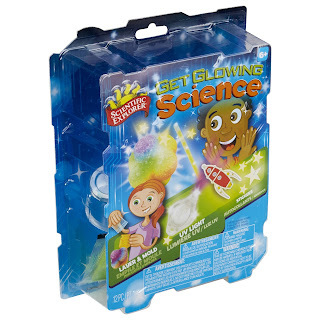 Scientific Explorer Get Glowing Science is incredibly fun! Alex Brands NEW! Scientific Explorer Get Glowing Science kit gives you everything you need to create alternate sources of light for a dark room. Kids can experiment with a black light, glowing bouncy balls, phosphorescent glow powder, glow sticks and glowing stickers. As a homeschooling mom I love that the instruction manual guides you through the steps of each experiment while teaching you the science behind them so that kids can fully understand the concepts and come up with experiments of their own! Alex Brands NEW! ALEX Toys Little Hands Ready, Set, Bodies is 8 arts and crafts projects that teach your little one what’s going on inside of them. As a homeschooling mom I absolutely love making learning fun which is exactly what ALEX Toys Little Hands Ready, Set, Bodies does. My 4 year old absolutely loved this kit and was amazed at what she learned. My 6 and 8 year old also joined in on the fun and had a blast making a body collage, a heartbeat drum, a paper bag lung, connecting the bones of a skeleton with pipe cleaners, a brain cap that shows what’s on your mind, a nutrition chart, a giant mouth to brush and learn to read without using your eyes. There's so much to do with ALEX Toys Little Hands Ready, Set, Bodies! Project Mc2 Way to Glow Science teaches you the secret to finding the clues that hide in the dark. Every super spy scientist needs to know what, why and how to make things glow. This kit includes a hand held black light, a glow stick and more to help you with your luminous experiments. My 8 year old loved this kit and couldn't wait to show her sisters and I all her glowing experiments. Project Mc2 Grow Crystal Chemistry is an absolute hoot! Simply stir the magic powder in water, add in the growing base and watch the crystals grow. The chemical reactions create beautiful keepsakes that you can display on the color change base for a fun light show. 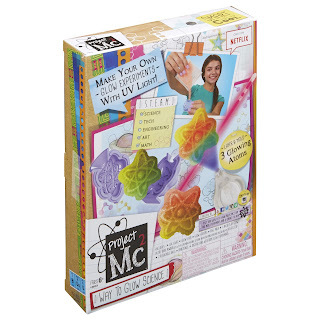 Project Mc2 Grow Crystal Chemistry is perfect for kids 6 and up and is sure to make a terrific gift! 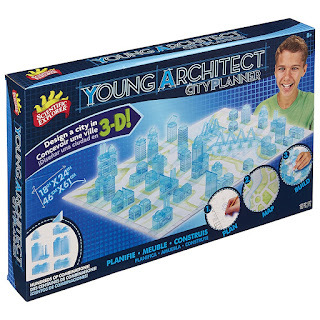 Scientific Explorer Young Architect City Planner Set is a great way to teach kids about architecture while having fun! Kids can design and build their dream city with colored pencils, templates, traceables and then organize their 3D buildings. My 8 year old spent hours designing her city and it was amazing to see her finished creation.